Welcome to another edition of our weekly trivia challenge, in which we test your knowledge of all things fly fishing and where you might learn a thing or two about this sport we love. This week, we’ve got ten new questions to make you scratch your head and wonder if your first answer is really correct. Scores on the last quiz were not great, but some of that may be attributed to a technical glitch in the software. I apologize to all who couldn’t get the quiz to work. Our hosting site decided to change its name from Polldaddy to Crowdsignal last Thursday, which created problems. Anyway, there were no perfect scores, although two respondents–steve and Steve Root–scored 90%. It was a good day for Steves. However, Steve Root took issue with question #7, about Montana’s native trout. The correct answer was “All of the above.” Rainbows are native to the Upper Kootenai drainage, and lake trout are native St. Mary and Missouri River drainages. The most common score fell to 50%. 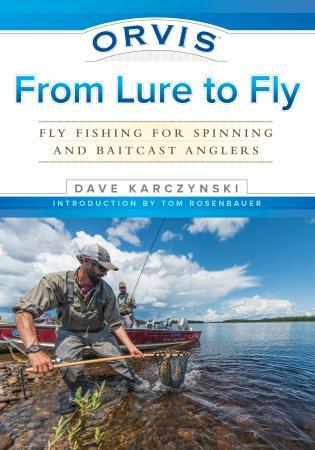 The winner of this week’s random drawing will receive a a copy of Dave Karczynski’s Orvis From Lure to Fly: Fly Fishing for Spinning and Baitcast Anglers. Karczynski helps conventional-tackle anglers translate and transfer their existing knowledge base and skill set as he introduces and reinforces core fly fishing concepts. The winner of our last quiz (as determined by random.org), and recipient of Chico Fernandez’s great book Fly Fishing for Bonefish, is DavidR, whose score was extremely average. 60% I’m on a downward path. I think I overthought a few questions. Not bad considering I had no idea and was just guessing on several. 90% Best i have ever done! 40%. Not sure how I did that well. 100% guesses. 60%, which includes a lot of lucky guesses! 90% Two weeks in a row! However I learn something every week. 60% – heading in the right direction! 80%…I’ll take it after last week. 60%. Just to throw in my 2¢; I understand that US rivers, historic figures and fly tiers should feature in this sort of quiz but I always find the fly pattern, casting and theory questions to be the most interesting. I may or may not be alone there. 50% Think I will go fishing using my puddle cast! 80 with several admitted guesses. 60% – I’ll take it for a rainy Friday. 90%, my personal best (two were wild guesses)! 80% Finally a decent score! 80% FINALLY a decent score. 80%, guessed on a few of them to be honest. 40% me needs some more edumacation! Wow, even a blind squirrel gets 70% now and then! Guessed on a couple of them. 80% is a vast improvement from the last three quizzes. 90% this time. Down from 100% on my last try. I have to admit there were a couple lucky guesses.